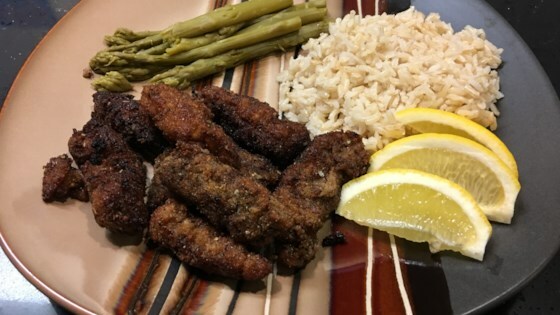 "Delicious and tasty chicken fried steaks with a zesty Latin touch." In a shallow dish, combine the breadcrumbs with the oregano, cumin, and salt and pepper. Beat eggs in another shallow dish. Dip each steak in beaten eggs, and then in the breadcrumb mixture. Make sure to cover each steak well with the breadcrumb mixture. In a large, deep skillet, heat 1inch oil over medium high heat. Place the steaks in the oil when it's hot (so that the breading will not stick to the pan). Cook steaks, turning once, until brown for well done and golden brown for medium. Serve with lemon slices. Found this recipe to be a wonderful update on an old comfort food.I chose a little healthier version by sauteing in olive oil. So delicious and easy. Tasted great the next day too! I fried my steak in olive oil with fresh garlic. I also added some garlic powder and Mrs. Dash to my bread crumbs. Yumskers! 2 cups of oil for frying is excessive not to mention unhealthy. I found that not even 1/2 that is plenty.